In this article you’ll discover five social media tools to improve productivity. 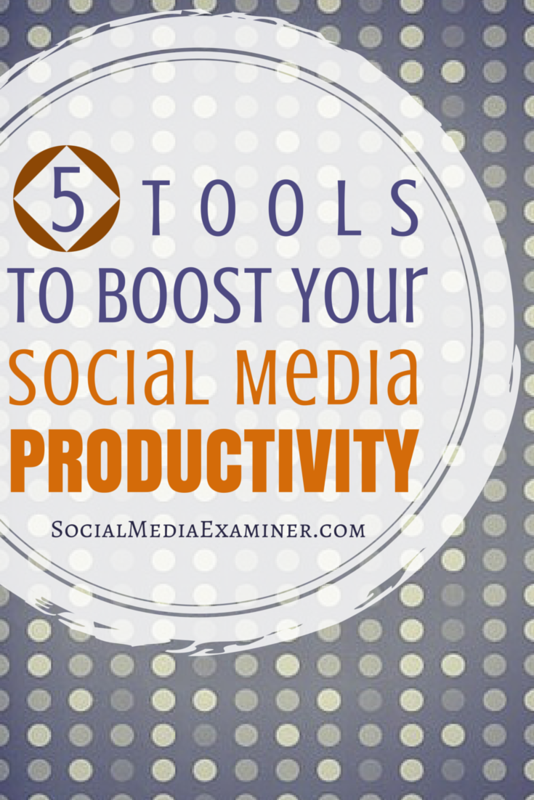 Discover 5 tools to boost your social media productivity. Image background: Flatiron. Photos trigger better social media engagement. However, because each social platform has its own preferred dimensions, resizing your images to meet the sizing guidelines for different social networks can be time-consuming. This is where Social Media Image Maker comes in. It’s an easy-to-use image-sizing tool that works for a large number of social networks, including Facebook, Google+, LinkedIn, Pinterest, SlideShare, Tumblr, Twitter, Vimeo and YouTube. 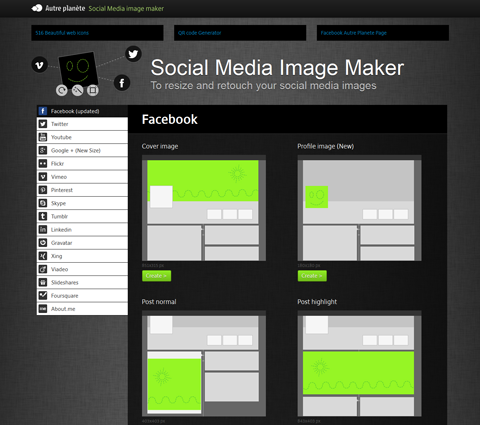 Social Media Image Maker makes it easy to resize your images for fifteen different social platforms. 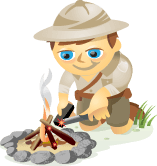 Using Social Media Image Maker helps make the process of resizing and retouching your images much less labor-intensive. It’s a good way to free up your time for other important tasks. To make sure your social marketing efforts are paying off, you need to measure their impact and track ROI. These tasks are much easier to do with a tool like Cyfe, the ultimate social media dashboard for managing campaigns. Cyfe tells you about the likes, views and clicks received by your Facebook content and provides in-depth Twitter and LinkedIn analytics. 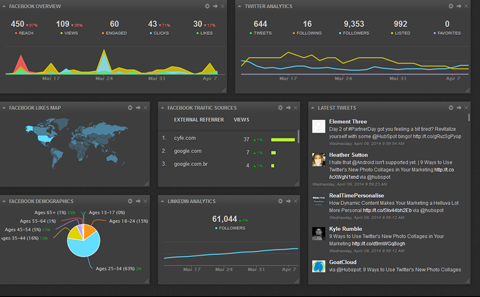 It also offers a truckload of data that helps you evaluate the performance of your social campaign. Cyfe gives you a detailed look at your presence across various social networks. Things change quickly in the social media world, and by staying on top of your campaign’s performance, you’ll be ready to initiate a course correction if something goes awry. Social networks play a huge role in influencing consumer decisions. This is why one of your key social objectives should be connecting and engaging with brand influencers. These are people who often have hundreds of thousands of followers, and building meaningful relationships with them provides more exposure for your brand. Sustained and meaningful influencer engagement can drive traffic to your site and lead to more sales. The problem is, how do you find brand influencers? There are two great tools that can help you with that: Brandwatch and BuzzSumo. 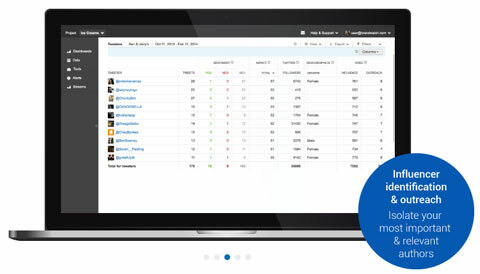 Brandwatch gives you social data from the perspective of brand mentions. You get a ringside view of all of the chatter about your brand and products. Brandwatch uses social media monitoring to find influencers who are creating and participating in conversations in your niche. This data helps you identify the conversations that matter, as well as the people behind those conversations. You can then start engaging with key influencers in your niche who can provide real value to your business. 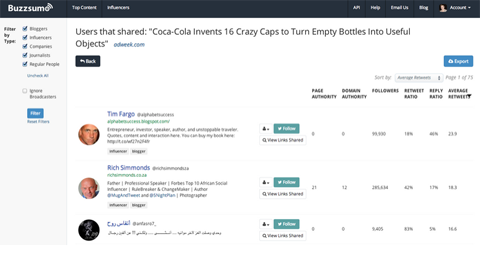 BuzzSumo enables you to search for the most popular content by topic, discover content ideas and search for key niche influencers. You can search for influencers based on their topical expertise, number of followers, location, follower interaction and authority. BuzzSumo helps you zero in on the influencers who are best positioned to give your brand a nudge with their own audiences. If videos aren’t part of your content marketing campaign, you are missing out on an important lead generation opportunity. To take advantage, you need to create videos and upload them not only to YouTube, but also to plenty of other video sites. Obviously, handling all of these video tasks requires a lot of time and effort. What’s more, how do you keep track of the views your video gets on each site? TubeMogul enables you to upload your video to dozens of video sites at once, simplifying and optimizing the process. It also gives you an overview of analytics for each site, enabling you to track the performance of your video across each platform. You know which sites are attracting the most viewers and whether your video has been optimized to attract your target audience. 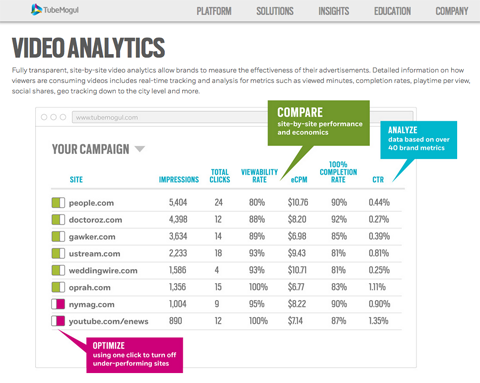 TubeMogul provides data on the performance of your social media videos. The idea is to use videos to optimize conversions, and TubeMogul helps you do just that. One big challenge for marketers is managing the time they spend scheduling and sending content to various social profiles. These important tasks can be time-consuming and may go wrong if you aren’t careful. You don’t want to end up in a situation where you forget to send a post or simply don’t have time. 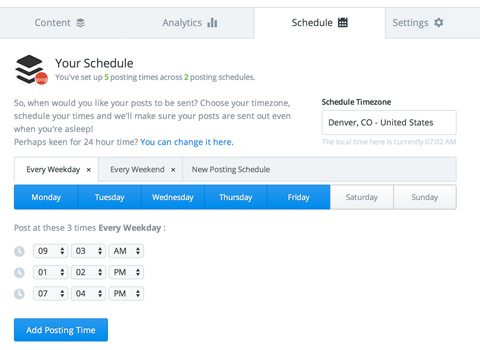 Enter Buffer, a popular social media tool that simplifies scheduling and posting. All you need to do is create a content lineup and use Buffer to choose which social profile you want that content to be sent to and when. Use Buffer to schedule posts and choose which profiles to send your content to. You can link your Buffer account to your Facebook pages, profiles and groups; Twitter; LinkedIn profiles and company pages; Google+ pages and App.Net profiles. By using Buffer, you can focus on creating content, and the app will take care of spreading it across social media. What’s more, Buffer offers intuitive analytics that tell you which posts have performed best. As a social media marketer, you face many challenges and demands. Whether you’re managing profiles, evaluating the effectiveness of social activities or creating share-worthy content, social tasks eat up a lot of your valuable time. Fortunately, there are social media tools that can make your job easier. Pick a tool that is the right fit for your needs and run with it. 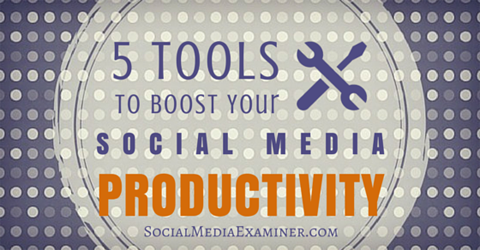 And keep adding tools to your toolbox to further boost your social media productivity. What do you think? Have you used any of these productivity tools? How have they helped streamline your daily task list? What helpful tools can you share? Please leave your comments below. Tips for boosting social media productivity. Image background: Flatircon.com.